The newly developed gel ink in the Pilot G-Tec-C Pen allows smooth, ultra-fine writing that is smear-proof and non-feathering. 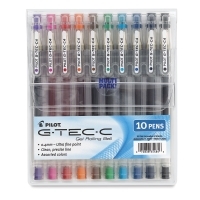 Ideal for detail work and extremely fine writing, the G-Tec-C features a 0.4 mm rolling ball point and a clear barrel with visible ink supply. Set of 10 — The set of 10 pens includes Black, Blue, Brown, Green, Navy, Orange, Pink, Purple, Red, and Turquoise. Set of 5 — The set of five pens includes one each of Black, Red, Blue, Green, and Purple.